As we begin to transition into winter, it’s important to take steps in protecting your pool for its glorious return in summer. Don’t fall into the trap of thinking that simply covering up or draining your pool will be enough to protect it in fall or winter. If left unkept, you risk your pool not only suffering structural damage, but also becoming unsanitary which could threaten your health and those of your family and pets. Taking a little time to fully prepare your pool for winter and maintain it out of season will ensure your pool remains fully functional. This will also enable you to open your pool quicker when warmer temperatures return! You may think, why clean the pool now when I won’t use it for several months? Even with frigid temperatures, there’s a risk of stagnant water becoming foul. Algae and bacteria formation will not only mar the appearance of your pool but actually delay the reopening process. Again, this is also a safety concern! You’ll want to use remove all leaves and debris in the pool before adding chemicals. Be sure to also skim the sides of your pool with a scrubber to dislodge any hidden grime. Additionally, be sure to clean and dry the DE filter. Winterizing pool chemicals such as algaecide and chlorine shock treatments will fully cleanse and disinfect the water. If you’re not sure you have the proper materials, you can also buy winterizing kits with all of the appropriate chemicals and directions. One of the biggest threats to your pool in winter is of course freezing. Freezing water in the pipework could lead to ruptures the water must be drained and the pipes dried to prevent this. You can also use swimming pool-grade antifreeze. 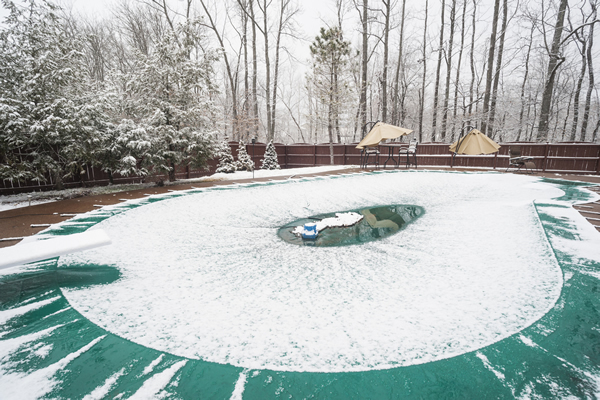 Ensure that your pool cover is durable to withstand ice and snow. Remember, this is one of your pool’s first defense in winter. Consider using a water-proof tarp for added protection. As mentioned previously, your pool fencing will only keep intruders out, but it will also keep you, your family, and animals out of the pool during a time that falling into the water could be deadly. Make sure the gate and fencing are stable. If anything seems loose, a storm could further weaken the fence and send it into your pool. Seek help now, to prevent this in the winter. If you don’t have a fence for your pool, consider getting one installed this winter. You’ll actually find this season to be an excellent time to add this feature! Call us at 410-803-9499 or fill out a contact form and one of Excel’s representatives will contact you promptly on how we can develop the fencing that will fully protect and highlight your pool. This entry was posted on Tuesday, November 21st, 2017	at 8:33 am	. Both comments and pings are currently closed.